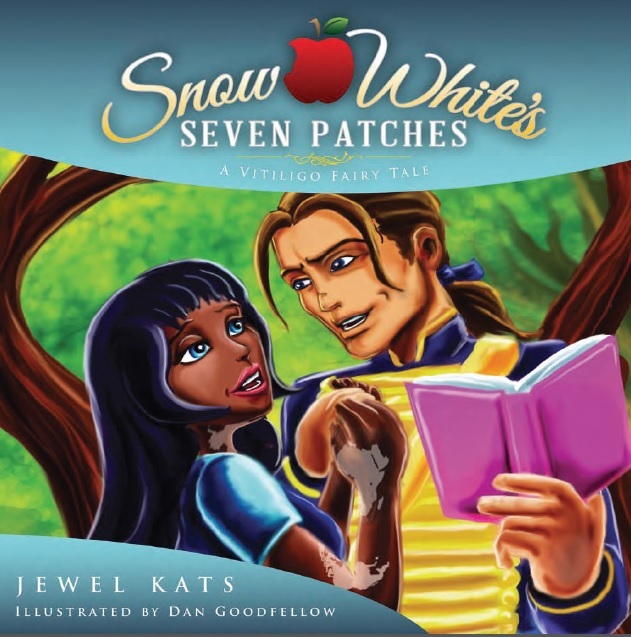 My 8th Book — Snow White’s Seven Patches: A Vitiligo Fairy Tale — hits the market! “Snow White’s Seven Patches: A Vitiligo Fairy Tale” is my eighth book, and third in the Fairy Ability Tales series. This is the FIRST fairy tale in HISTORY featuring a Princess with the skin condition of vitiligo. PICTURE BOOK PLOT: “Snow White’s Seven Patches: A Vitiligo Fairy Tale” is a modern-day story with the classical theme of good conquering evil. You’ll find the age-old ingredients of a magic mirror, poisonous apple, dwarfs, and romance here. However, this adaptation includes a vain mother who’s so clouded by beauty myths that she keeps her own daughter a secret, while plagiarizing the workings of her mind. Everything falls apart when the good mirror finally speaks the truth! First a Comic Strip…Now a Book is Out? Yes, you read that correctly. Your favorite reality-series comic strip character now has a book out by Marvelous Spirit Press! 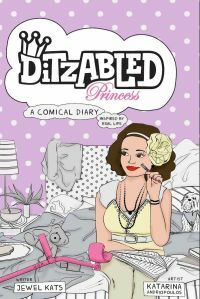 “DitzAbled Princess: A Comical Diary” is a hybrid of a comic strip collection meets a graphic novel layout. You can purchase the book at many fine online retailers. Don’t miss out on the laugh(s)! Art and design of the book are by, Katarina Andriopoulos. One icy-cold winter night, everything changes: a young girl shows up at the king and new queen’s castle doorstep wearing little more than a purple jacket and carrying a black pouch. The king recognizes the mystery girl’s identity as the long-lost princess without her uttering even a single word. However, the new queen refuses to believe the king’s claims. In turn, a devious plan is hatched… and, the results are quite fitting! This new twist on Hans Christen Andersen’s The Princess and the Pea is surely to be loved by all fairy tale enthusiasts. Jewel Kats reads Cinderella’s Magical Wheelchair aloud! 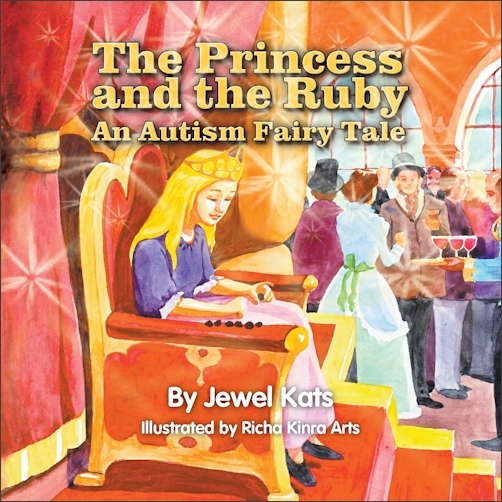 Cinderella’s Magical Wheelchair by award winning author Jewel Kats & illustrated by Richa Kinra. In a Kingdom far, far away lives Cinderella. As expected, she slaves away for her cranky sisters and step-mother. She would dearly love to attend the Royal costume ball and meet the Prince, but her family is totally dead set against it. In fact, they have gone so far as to trash her wheelchair! Unlike other fairy tales, the concepts of sharing and caring are seamlessly woven together. Teddy Bear Princess is a sweet, plush Royalty figure who deeply values her friendship with unicorn, Zumba. Luxury may be at her fingertips, but it’s Zumba whom she holds nearest and dearest. Together, this duo flies sky-high in their quests to give. 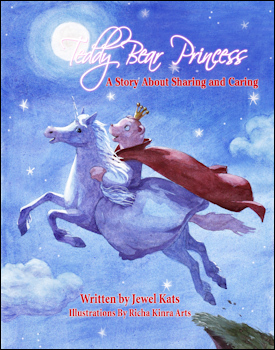 Teddy Bear Princess is sure to delight children and fantasy-enthusiasts time-and-time again. –Robin Marvel, author of Awakening Consciousness: A Girl’s Guide! White-and-black word searches are SO yesteryear. Where’s the jazz in that? Divas don’t play that game. We demand more. Finally, finally, finally there’s a word search book for us. Think: glamorous. Think: to-die-for fashion shots. Think: unusual shapes. It’s time to say tah-tah to oh-so-blah puzzle books. And, say hellooo to: WORD SEARCH DIVAS! Jewel Kats, 32, is a Diva with a closet stuffed with fashion accessories. Despite chaos, Jewel manages to work her chic tail off. She’s authored three children’s books for Loving Healing Press. For six years, she penned a syndicated advice column for Scripps Howard News Service and TorStar Syndication Service. She’s won $20,000 in scholarships from Global Television and women’s publisher, Harlequin Enterprises. Jewel also interned at Entertainment Tonight Canada. So what’s got her through all this? Why, red lipstick, of course! White-and-black word searches are SO yesteryear. Where’s the jazz in that? Divas don’t play that game. We demand more. Finally, finally, finally there’s a word search book for us. Think: glamorous. Think: to-die-for fashion shots. Think: unusual shapes. It’s time to say tah-tah to oh-so-blah puzzle books. And, say hellooo to: WORD SEARCH DIVAS! Maggie and Momma love going for walks. During every outing, Maggie learns about something new. Today’s no different! Momma has arranged for Maggie to meet lots of people in her neighborhood. They all have different jobs. They all come from different cultures. They all use different things to help their bodies. Maggie doesn’t just stop to chit-chat. Rather, she gets to the bottom of things. By asking the right question, she discovers how many people with disabilities use aids to help them out. Let’s find out how they work, too!